Norton is proud to present the legendary lost 1965 album from the King of the New York streets-- 2017 Billboard Top Ten Critics Choice LP for reissues! Congrats, Dion! KICKIN' CHILD LP HITS THE STREETS ON MAY 12! NYC RECORD RELEASE PIZZA PARTY MAY 11? Dion had a new album ready to roll at Columbia with his group the Wanderers in 1965, but it never made it out of the gate until now! 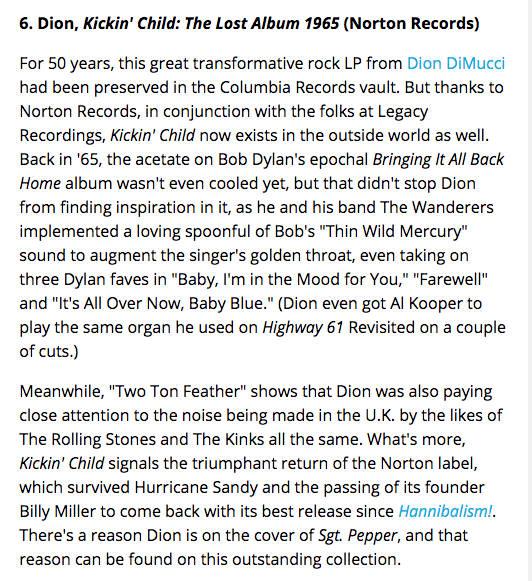 Dig Dion's KICKIN' CHILD on Norton Records. Fifty-two years was a while ago, but this collection is totally TODAY! Join us at the Norton record release party for KICKIN' CHILD on Thursday May 11 from 7 PM-11 PM at Berlin, 25 Avenue A, NYC. Come hear it in all its glory in the underground benevolence of Jesse Malin's fabulous nitery Berlin. Records + pizza = instant party! Psst- Yes, Berlin is the legendary East Village hangout club house located beneath the sidewalks of 2A- the password is FORDHAM BALDIES 'cause we're officially declaring all territories DION turf! Dig the 45 RPM single with non-LP unissued b-side, too!